tracieclaiborne.com: I need your ideas! The past few days have been a blur! Yesterday, I had about 10 errands to run and today looks about the same. I have some cards to share but I didn't take time to photograph them yet. I will try to today. I am working on VBS stuff this week...it is Thursday through Saturday at our church. I guess we'll just cut out a piece of blue construction paper, glue some balloons on that I will cut out with my Silhouette and I'll probably print the airplane somehow on the background and then have them glue cotton balls to the blue part for clouds. I need a 2nd craft and I also need some for the older kids (7-10). Any ideas??? I don't mind cutting some things with my Silhouette but this is 100 kids so I don't want to wear it out. I need hot air balloon or faith themed crafts. If you know any great kid crafts - do share!! I promise to be back with a crafty post tomorrow. There was a superhero movie a few years ago called sky high. About teens with superpowers......that is what I think of now when I hear that phrase. Hope you get some good ideas, my 16 yo dd is the station leader for Chadder in July and we want to copy what you come up with . 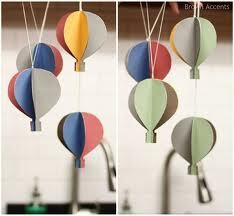 We love your hot air balloons and will have lots of helpers to cut them out. It looks like four pieces per balloon? 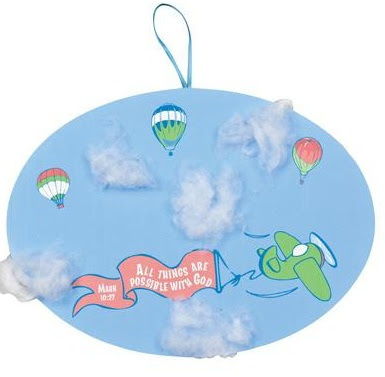 For the 3D balloons, find or create clip art of a hot air balloon print on colored cover stock You could order this at Staples in a variety of colors so you don't use your own ink.